All 17 TOMS promo codes have been verified and tested today! Valid on orders worth $75 or more. TOMS is dedicated to the mission of supporting and providing for communities of children around the world. That’s why it gives a 10% academic discount to all teachers and students who shop at TOMS online and in-store. If you qualify, head to Toms.com to establish your academic status with SheerID, an online company that works to make verification simple. Once you’re approved, you can claim your discount on all regular-priced shoes, apparel, and sunglasses throughout the store. You can redeem your TOMS discount code online throughout the year and also apply your academic discount in-store. Just bring your student or teacher ID and you’ll receive your discount at check out. Get the latest on Toms promo codes, up-coming sales, and news sent right to you. Sign-up for the TOMS email newsletter and see the many ways you can save. You will be sent information on exclusive Member Appreciation Sales that you wouldn’t hear about otherwise. Don’t miss another TOMS savings opportunity ever again. You can sign-up at the bottom of each page on TOMS.com. Do you and a friend want to save money on your next TOMS order? Refer a friend to shop online and you’ll both receive a $20 TOMS coupon code on an order over $75. Join the over 500,000 customers who shared this deal with a friend. Simply go to Toms.com and send an invite to your closest friend. You can also opt to receive the TOMS newsletter to hear about more sales and products. Want to get your new TOMS items sent to you at no cost? Spend over $59 and receive free shipping on your whole order. From classic slip-on styles to stylish sunglasses to socks and apparel essentials - stock up and get your purchase delivered at absolutely no cost. Weren’t completely satisfied with your order? TOMS accepts free returns on unwashed, unworn items that were purchased from Toms.com within 30 days of the order date. In continuing its efforts of giving back, TOMS wants to thank military members, family, and veterans for their service by offering a discount on items throughout the store. Once your status is validated, you will receive a TOMS promo code for 10% off. Although the TOMS promo code cannot be combined with other promotions and offers, you can use this discount code all year round. Plus, you can get this discount when you shop in any TOMS store. 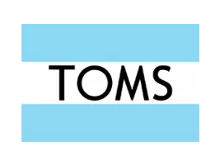 Simply show your military identification to a TOMS sales representative at check-out to start saving. On orders over $100 minimum. Ready to step-up your shoe closet? Check for TOMS coupons and get big discounts on all your favorite styles when you shop online. Some of the best TOMS coupon codes are still to come. Check often so you don’t miss a single opportunity to save. You can also find big savings during one-day-only flash sales. Look out for discounts on select items throughout the store and free shipping deals with no minimum purchase. Ready to explore the many ways you can save while shopping with TOMS? Join the TOMS Passport Rewards Program and get benefits while you shop. Buy all your favorite TOMS items and receive points for every purchase. This means you can earn points on your purchases of stylish shoes, apparel, and sunglasses so you can save even more on your next order. That’s not all, once you’ve earned 200 points, you become a Level 2 Trailblazer so you get even more benefits. You’ll receive free shipping for a year and access to even more sales. Did you know that for every pair of shoes you buy from TOMS it gives a pair of shoes to a child in need? This is called the TOMS One for One program. Now you can support the movement and get some money in return. Simply apply online by giving some of your business and personal information and you can be earning money for every shipped sale made from your links.